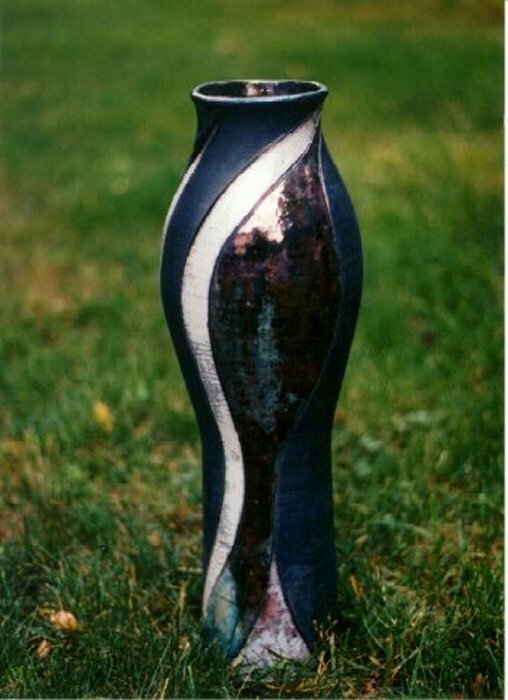 These pictures show the process of a raku firing, step by step. 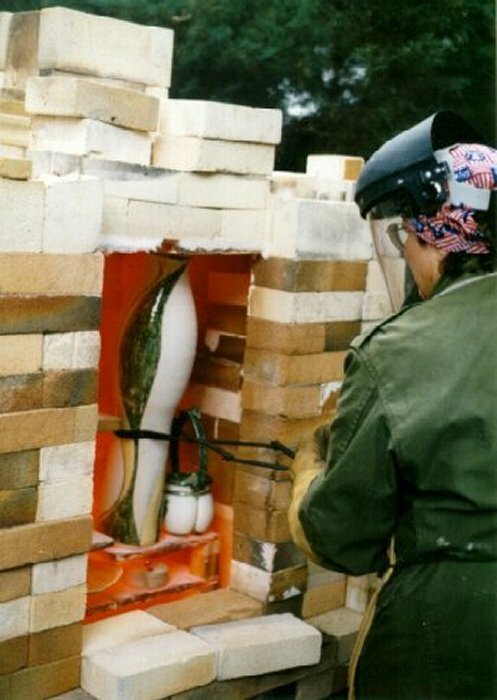 This photo shows me putting various pieces into the kiln I built. They have been bisqued (the first firing, sets pots up to be glazed), glazed and ready to be loaded in the kiln. 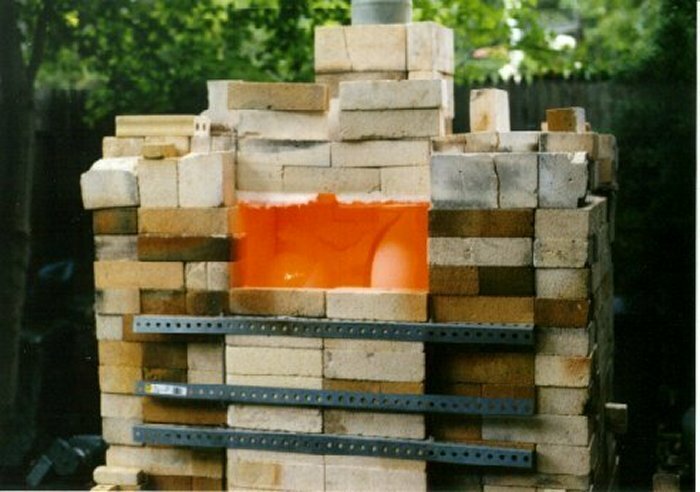 The large kiln is a gas fired and takes about 3-4 hours to fire, reaching 1750°F. The large white pot I am handling is white clay and will be followed throughout these photos. 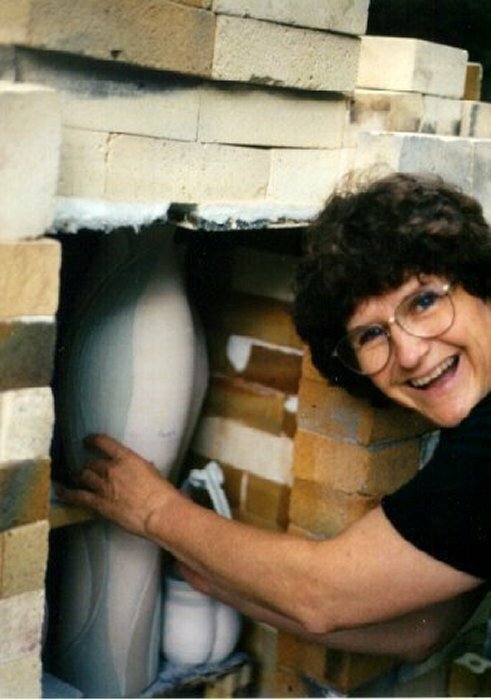 This photo shows the kiln has reached 1750°F and the door has begun to be taken down. You can see how hot the fire is. The pot we are following is in the right hand corner. 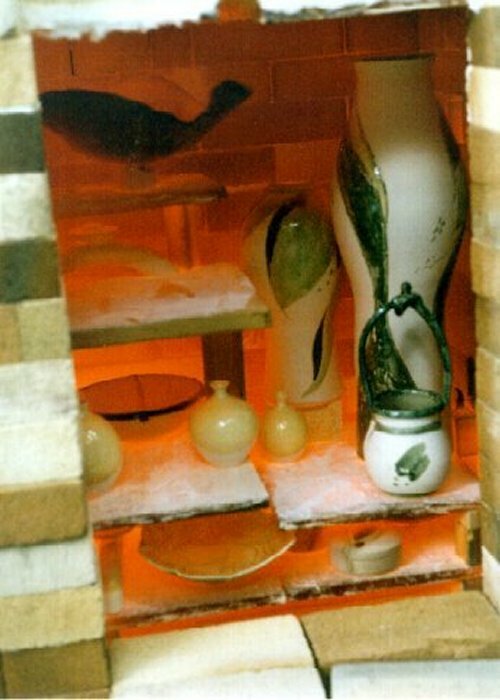 This photos show the kiln with the door fully taken down giving me full access to take the pots out. I use tongs for the most part, but large sculptural pieces are picked up by hand using heavy Kevlar gloves. 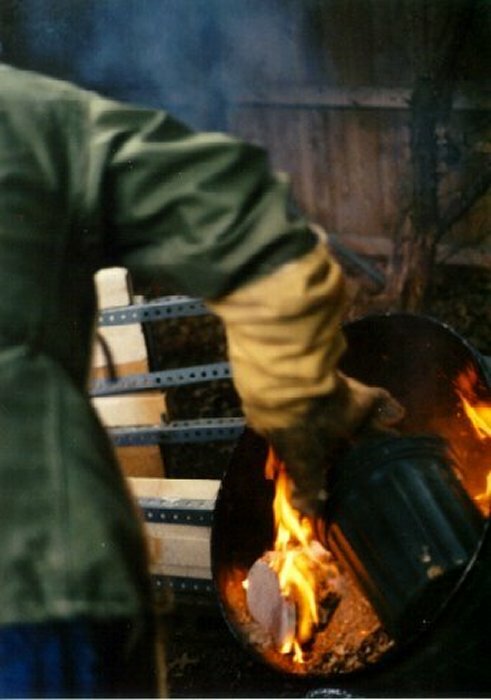 Next stage of Raku firing is removing the pieces from the kiln and putting them into some combustible material. I place them in “smoking chambers” containing sawdust which immediately ignites. I then dump more sawdust on top of the pot and close the lid. Without oxygen, the chamber smokes bringing out all the lush colors and trapping carbon in the exposed clay. This photo shows me covering the pot with more sawdust and how immediately the sawdust ignites. It is a tall piece, so the smoking chamber is set a bit on its side. Once enough sawdust is added, the can is covered and up-righted. Here is the finished product. It has been scrubbed with soap and steel wool, then sealed to keep the colors from fading. The glazes are a wonderful mix of copper, blues, pinks and white crackle. The exposed clay is quite black.